What has been one of your most memorable experiences at Southeastern so far? The most memorable experience isn’t a one-time event that occurred. As a leader of the House System, I have had the luxury of watching brothers and sisters in Christ grow tremendously in their walk with Him. One of those students worried me when he first came in, but within two years of being poured into and having the opportunity to pour into others, he is alongside of me leading others for the same goal. Discipleship is one of the most beautiful experiences that I have seen for many of the students and for my own personal life. How are you hoping to serve the church and fulfill the Great Commission? I plan to pursue an M.Div. in pastoral ministry, followed by a Ph.D. in ethics. I hope to be a pastor and possibly an author and professor of ethics. My main desire is to give my life for the mission God has given me. I am willing to go anywhere and do whatever He desires. Which classes have most equipped and encouraged you to do this? I would say the classes that have helped me with this are evangelism, ethics of life and death, and Christian theology 1 and 2. How has the local church played a vital role in your spiritual growth? The local church has helped me out tremendously in my sanctification. Coming into Southeastern there were sin issues that I was blind to that the local church helped me see and deal with. Also, the local church has cultivated a passion in me for the mission of God and has given me many avenues in which I can serve. The local church has poured into me and given me opportunities to pour into others at the same time. 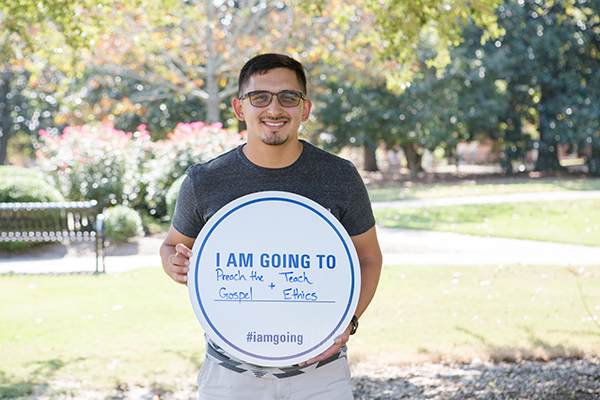 What would be your encouragement to students who are considering Southeastern? Southeastern isn’t for everyone. However, it is for those who are on the mission of giving their life for the cause of Christ. Southeastern equips students for that very mission. I personally have grown more as a man of God in these four years than I ever had. I love that this school isn’t easy. It challenges and pushes its students to be better for the gospel so that we can fulfill the Great Commission well. If you would love to be in a community that cultivates such things then Southeastern is truly a place for you.